Season the meat evenly on both sides with salt and pepper. In a braising pan with high sides, heat the oil over high heat. Add the ribs to the pan and sear on all sides until browned, about 1 minute per side. Pour in the beer and add the tomatoes to deglaze the pan. Cook, stirring, for 2 minutes. Add the tomato paste, chiles, tamarind paste, garlic, orange zest, brown sugar, canela, bay leaf, allspice, thyme, and beef stock. Decrease the heat to low, cover the pan, and simmer until the meat can easily be pulled from the bone with your fingers, about 4½ hours. Don’t overcook the ribs, or the meat will be mushy. Shred the meat and serve immediately or keep warm in the pan until ready to serve. 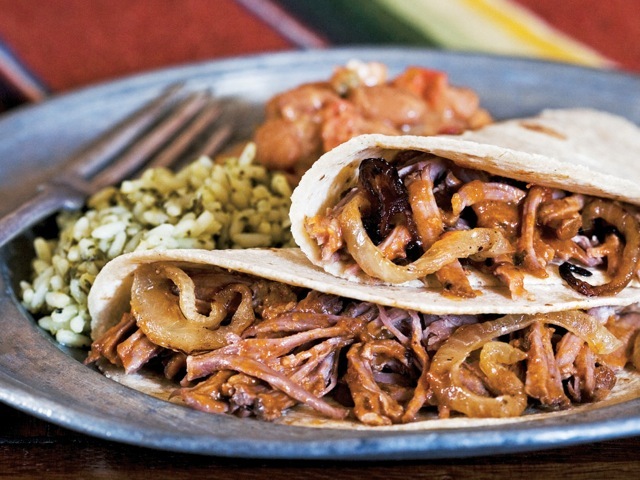 To serve, lay the tortillas side by side, open face and overlapping on a platter. Divide the filling equally between the tortillas and top with onions and salsa. Grab, fold, and eat right away. Or build your own taco: lay a tortilla, open face, in one hand. Spoon on some filling, top with onions and salsa, fold, and eat right away. Be sure to purchase the meatiest short ribs available, without too much fat. They should be thick-cut, 1- or 2-bone size, about 4 inches long, and almost 2½ inches thick. Cook over the lowest temperature possible, always below a simmer (you’ll see evaporation, but no movement of liquid) until the meat is ultra-tender and falling off the bone. The flavors here are sweet-and-sour Latino, matched well by your favorite dark beer. As an interesting alternative to beef, you could try buffalo short ribs. Either way, be sure the meat is fresh and bright red. For the richest, most succulent short ribs, seek out a premium butcher shop where they sell prime beef short ribs, which will have an amazing marbling of fat. Caramelized onions make a hearty winter garnish, and very thinly sliced red onions are a fine partner in the summer.